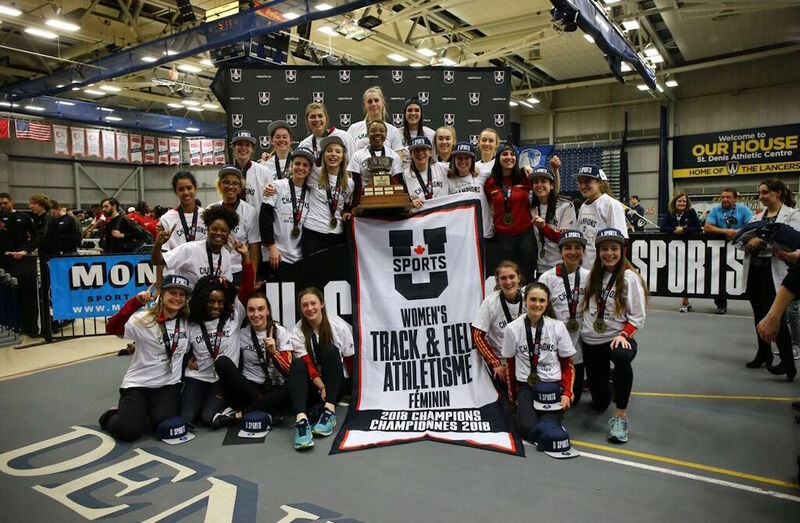 The Guelph Gryphons claimed their first golden sweep in a decade on Saturday, on the final day of the 2018 U SPORTS Track and Field Championships at the Dennis Fairall Fieldhouse in Windsor, Ont. For the men, it’s the second consecutive national title, while the women captured their first U SPORTS banner since 2014. Windsor’s Kelsey Balkwill was honoured as the Female Athlete of the Meet following a four-medal performance at the national championships. In addition to capturing three medals on the final day of competition, Balkwill also placed first overall in the women’s 300m. For the men, Guelph’s Tommy Land and Alberta’s Austin Cole were named co-Athletes of the Meet, alongside Gryphons head coach Dave Scott-Thomas, who was honoured as the Dr. Bob Boucher (men’s) and Sue Wise (women’s) Coach of the Year for both the men’s and women’s teams. The Guelph women had another productive day, remaining well ahead of the pack throught. The 4x200m relay team set a new facility record on their way to winning gold, knocking a hundredth of a second off the old record with their time of 1:37.97. In the field, Maja Naruszewicz secured another gold for Guelph with her performance in the high jump, clearing 1.74 metres, while Jordan Bates brought home more hardware with a silver medal in the high jump clearing 12.33 metres. The Toronto Varsity Blues overtook the Windsor Lancers late in the day to claim the team silver medal. 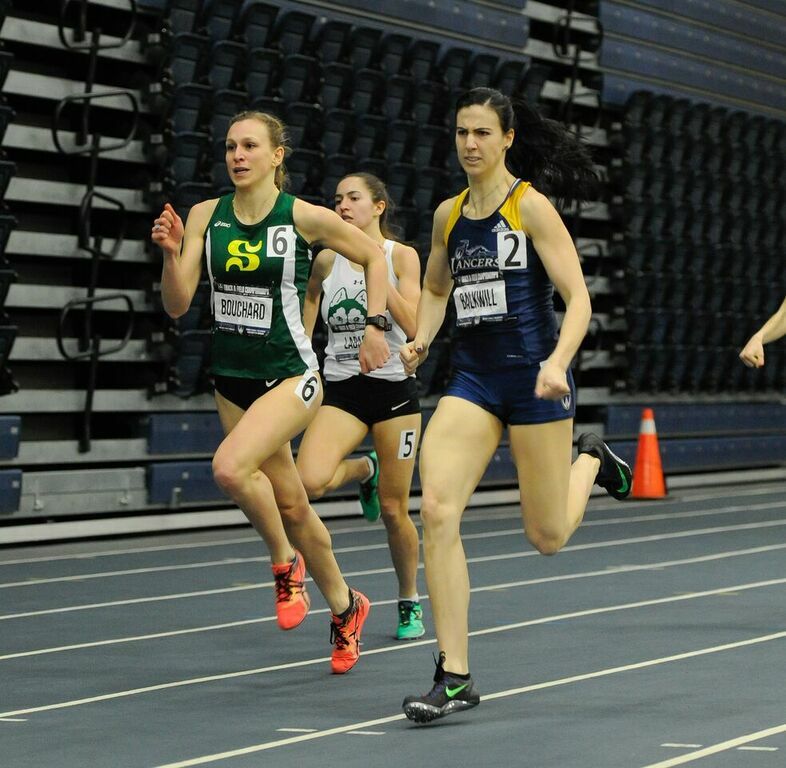 Lucia Stafford finished second in the 1500 metres with a time of 4:25.69, while Emily Branderhorst brought home silver in the high jump with leap of 1.74 meters. The host Windsor Lancers went in to the final day in second place but once the final gun sounded the Lancer found themselves in third. Balkwill started the day off setting a personal best while winning the 600-metre race in 1:29.37, before anchoring the 4x400m team that earned gold in 3:42.88. The women also reached the podium in the 4x200m, capturing silver for the Blue and Gold. On the men’s side, the Gryphons had first place essentially locked up before the day began, and as the third day wound down the Gryphons added to their lead. 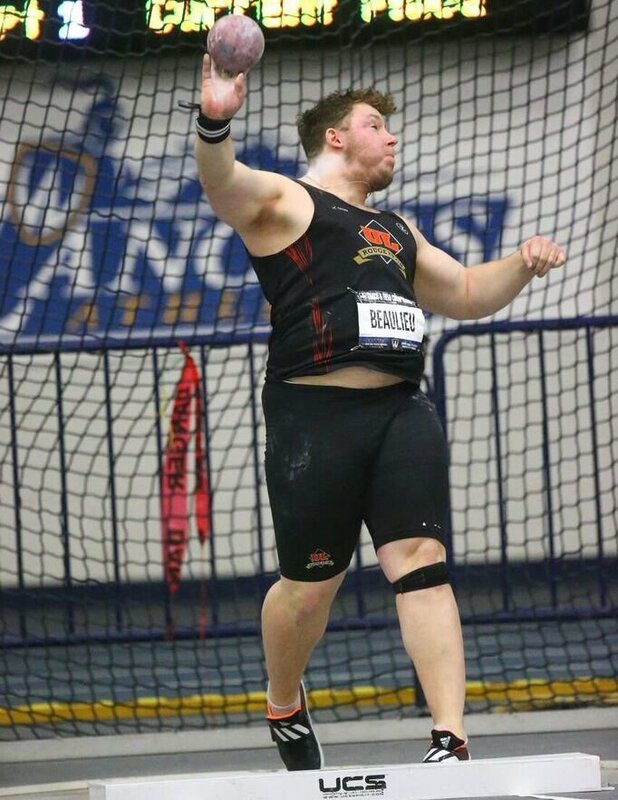 In the field, Guelph captured silver and bronze when Thomas Nedow and Mark Bujnowski threw for 15.98 and 15.95 metres in the shot put respectively, while Land continued his dominance on the track, winning the 600-metre race in 1:19.41. 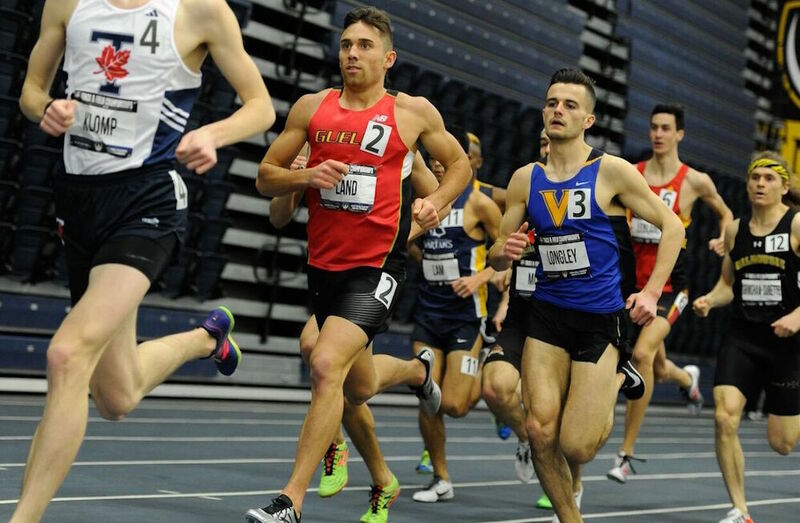 Guelph also took home bronze in the 4x200m relay with a time of 1:28.65 as well as in the 1500m when Mostafa Elkurdy crossed the finish line in 3:55.74. In second, were the Alberta Golden Bears who dominated the relays, winning the 4x200m in 1:27.35, as well as the 4x400m in 3:17.46. Alberta also picked up a silver in the 1500-metre run with a 3:55.05 performance from Royden Radowits. Rounding out the team podium were the Laval Rouge et Or, who took gold in the men’s shot put on the strength of Simon Beaulieu’s 16.42m throw. Laval also picked up a medal in the 600m when Vincent Duguay ran 1:19.75, good enough for third.